Center of Gravity (COG) Divergence generation III is modern indicator with complex mathematic algorithm (BJF Trading Group innovation). You will see divergenses on the chart and indicator. Arrows painted above/below the open bar and not in the past. You can see when actually you can trade. It is never to late! Signals based on closed bars so the arrows above/below open bar never disappear. 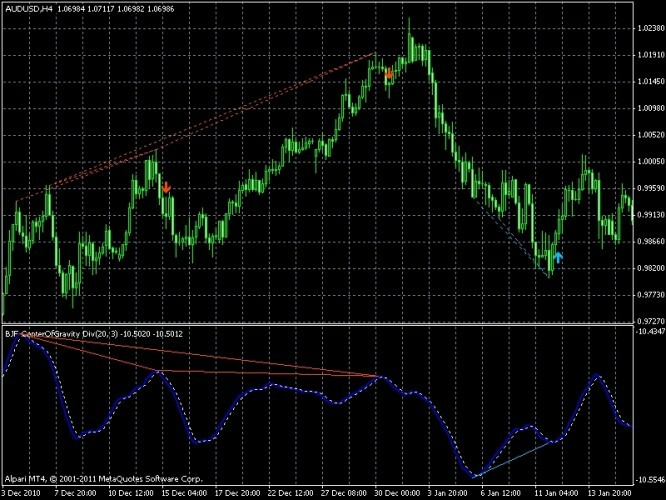 MT4 Indicator Center of Gravity (COG) Divergence indicates fractal divergence by Center of Gravity (COG) indicator.When divergence appears between Center of Gravity (COG) and the price, it indicates a high probability that the current trend will finish soon. A signal to buy is when a new Low-fractal is formed below the previous one and a corresponding Center of Gravity (COG) value is higher than the previous one. A signal to sell is when a new Up-fractal is formed above the previous one and a corresponding Center of Gravity (COG) value is lower than the previous value. The indicator has a lot of customizable settings. Center of Gravity Indicator actually has a zero lag and allows to define turning points precisely. This indicator is the result of Ehler's study of adaptive filters. The indicator Center of Gravity allows to identify main pivot points almost without any lag. The idea of calculating a center of gravity appeared from the investigation of lags of different filters with the finite impulse response (FIR) in accordance with the relative amplitude of filter coefficients. SMA (Simple Moving Average) is a FIR-filter, in which all coefficients have one and the same value. As a result the center of gravity of SMA is an exact center of the filter. WMA (Weighted Moving Average) is a FIR-filter, in which the last price change is weighted through the filter length, and so on.